Peta just finished this hilarious faux fur stole. She got the pattern on a recent trip to Scotland. Isn't it cute?! 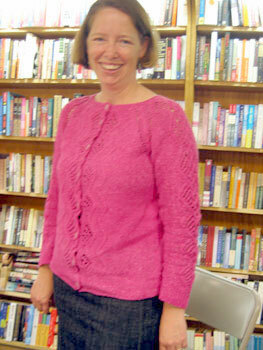 Yet ANOTHER pretty pink sweater from Peta! 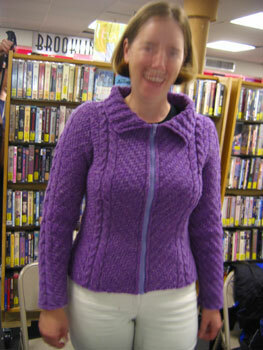 This one is knit in Jaeger Trinity and the pattern is from Harrisville Designs. 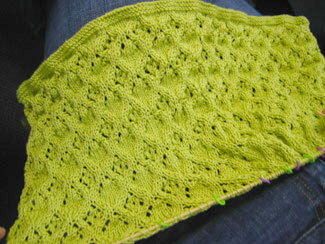 Check out the lovely lacework. Why can't I ever remember the details of Peta's fabulous sweaters?! 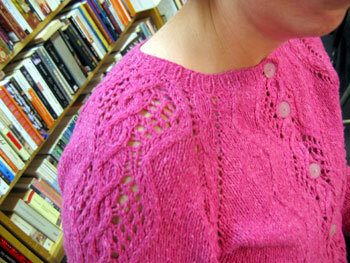 Another pretty Peta sweater. When did she make all these? 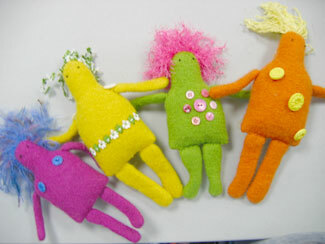 Peta made these funny little voodoo style dolls inspired by one she saw at Purl Diva. Aren't they hilarious? The Naturespun yarn felted up so well. 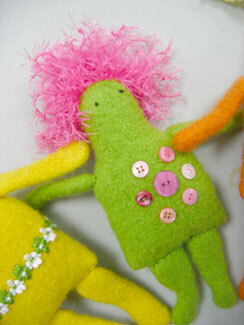 And all those buttons and funny yarn hair are awesome! 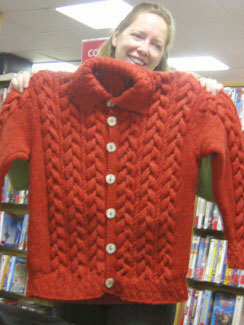 Peta finished the Jaeger Jethro sweater for her husband! 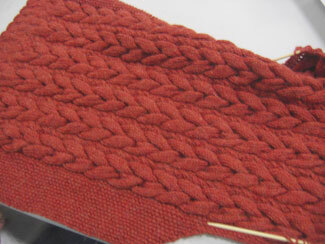 The pattern is from Jaeger's Men's Collection. And isn't that color great? Way to go Peta! 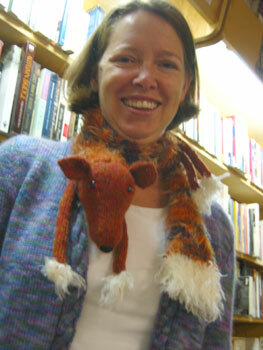 Peta brought a little friend with her to knitting last week. 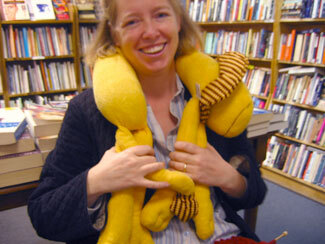 She's fixing up some torn seams on this fun lion for a local store after much loving from costumer's kids. Isn't he cute?! 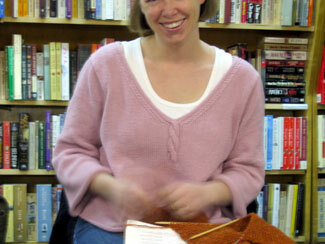 Peta's knitting a handsome man sweater for her man. He picked out the color and pattern. Check out the Jaeger man in the pattern pic. Ooooh yeah, nice, um, uh, sweater. 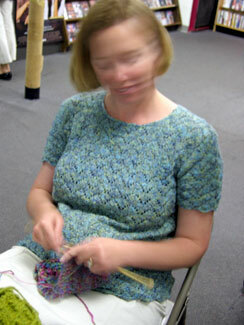 Yarn bras are goood, m'kay. 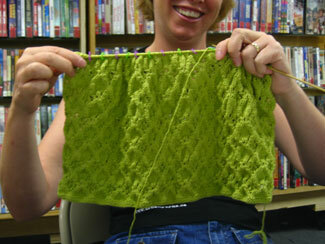 Peta continued to work on her prety green tiny-gauged lace sweater. This is the second piece here. 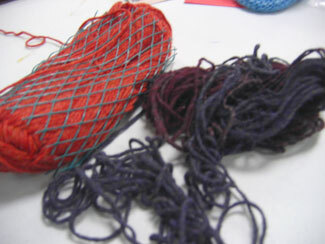 Peta was working on a Jaeger lace sweater. Check out upcoming updates to see all her progress! 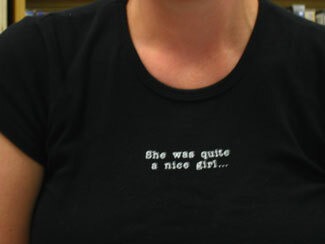 And she's got the coolest shirt!